Charles continued pacing even after Wilhelm’s barrier abated. “Yar,” Wilhelm grunted in Saxon. Everything in that tongue felt like a curse. The air became fresher. The barrier had even kept the air from leaving. Wilhelm bestirred himself and ached his way to his feet. He fingered the tight fitting, finely tailored suit he wore. “Restriction is for the soul, not the body,” he said and left the room. He leaned hard on his cane as he walked the hallway and entered another room. Charles followed. Wilhelm ignored him and muttered some dirge from a lost time. Its cadence brought to mind the ballet of that misbegotten Grendal. He donned one of his oldest brown woolen cloaks and straightened his back until more than a few of his ribs popped. Charles wiped sweat from his brow and followed his father down the stairs and into the night. “I was able to retain Marvin’s watch,” Charles said under his breath as they crunched over the gravel drive. “Prize?” Charles eyed the upcoming forest. The crunch of the thin dead tines of the evergreens announced their entrance into the great wood. Charles stopped and looked around. Not a sound of life stirred. A shape emerged and flowed through the forest. Its appearance, when Charles could pin it down, looked like a feral boy wearing a rich assortment of fabrics with flair poking out voluminously and arrayed in copious bundles, here and gone before the eye could discern the magnificent wonders of its mystery. The face belonged to the wilds, not to any civilized society. The eyes shone larger, the nose ran straight and fine. Hair shined spiky and brown above the brow, giving off an odd sheen in the absence of ambient light. Tonight, its teeth were locked firmly behind the tight lipped severity of its mouth. Wilhelm watched Agolloch close on Charles, his only living son, and smooth as water running, catch him up and carry him away. Not a sound broke the silence. Wilhelm followed. He knew where to go. He’d been there many times. Antin Ahiga performed his duties aboard the freighter like a desert abukcheech at night. A darker, danker, dirtier night he could not recall. Course, his memory was none too good since the beating he’d taken that’d givin’ him his cut up face. He’d seen dark a’fore in the holes his da’ had showed him in Nevada. He’d smelled danker air as well. Tonight’s sea sloshed briny, some stink of fertilizer clung to the ship, and an ever present piney taste kept turning in the wind. It sat odd, yea, but not unfamiliar. Master Captain Gentry had killed a man this night on the landward side of this mountainous isle. Death and its accruements weren’t too dirty for a man of Antin’s line. He rubbed a long, thick finger down his scar as he walked the deck. They ran no lights and Master Blaine manned the tiller. The others, there were six, had bedded down below in the empty holds in canvas hammocks enjoying the high ride of an empty ship as well as the added warmth. The lads were workers true. With numb fingers he opened the rope hooks of his double breasted tunic and let the cold touch his red skin. Wind, the true traveler, had been somewhere cold of late and the ship kept biting its way into it. He weaved his way to the back of the boat on sure feet wearing hard soul boots Master Blaine had given him. Master Blaine smiled at him in the dark. Antin didn’t know how he knew. He could not see in the utter black. He just knew like he knew their direction and the depth of the sea. He knew the shore was to his right and that he could swim it and he knew this dank, dark, dirty, dangerous business wasn’t over. “Restless Hunter?” Master’s smile was in his voice as well though the wind tried to rip it away. Antin shrugged his shoulders and shook his head. Master Blaine almost sobered but his good mood held. Antin had saved the day many times with his unique ability, but that didn’t seem to matter tonight. Master Blaine continued sailing in the black too close to shore, doing things no normal person could do. Antin had trouble shaking the dirt from it all. Agolloch had taken Charles to the very center of the wood. Wilhelm took care to measure his steps. Agolloch had planted every tree, had nurtured every root, and had shaped every limb. The delicate process was hard for Wilhelm. Each step was a pain that sought out his attention and demanded he disregard the world about him. “You’ve learned through the bestowed pain.” Agolloch’s tone wasn’t unkind. It just wasn’t human. Wilhelm bowed low then stood as tall as he could manage. Agolloch twisted Charles’ face toward Wilhelm. “He dies for his weakness. His softness has cost me a true third extension.” He pointed a long finger at Wilhelm. “You are too watch, My Wallis, as punishment.” Before Wilhelm could utter a word Agolloch ripped Charles to pieces and buried him in the dark soil around one of the great pines of the hillock. Wilhelm glanced for a mere moment at the torn dirt where his son lay. Agolloch with hands covered in bloody mud pointed to another of the great pines. It was the Wallis tree, the centermost tree in the forest. Agolloch cleaned his hands with fresh dirt. In the dark all color washed out, the edges of things appeared dull. “Vlad was once a favored son, as you are. We attempted a different path back then. I didn’t like the results. For all I know he’s still roaming out there somewhere.” Wilhelm had never heard of a time before his making. Man had been so few back then. “You’ve lasted the longest,” he said. He shook his sinewy shoulders and ran a tongue over slightly sharpened teeth then closed on Wilhelm. He drew Wilhelm into an embrace. The baubles and prongs that were some part ensemble and some part skeletal structure pressed deep into the ritual scars, cutting them anew. Wilhelm’s spine shuddered as he was lifted from the ground. He felt like a lightning storm had exploded through his body. He let go. He was nothing and everything. Vibrating tingles consumed him past the point of pain then coldness quickened to numb. It progressed. His feet felt the soft earthen forest floor. The cold night wafted across the back of his knees. The course fabric of his robe chaffed the tops of his thighs. His arms grew in sensation from shoulder to finger, joint by exquisite joint. There sat an ebb and flow of ability, all ability. His identity within his newfound sensual perception rested on some mystical balance of which Agolloch controlled. As always, he sensed there was more to be had, that Agolloch had held back. His weakness was no more. His pain was gone. He could move. But there was more. He could see. He could hear. He smelt and smelt and smelt. His emotions, which once bubbled in his chest and pinged and burned in his stomach, were now conjoined to his skin, to the outside. “Master,” His saying the word, hearing the word, meant something more. Agolloch walked to the Wallis tree, parted the trunk like a man parts drapes, and stepped inside. A painful light sparked from within. 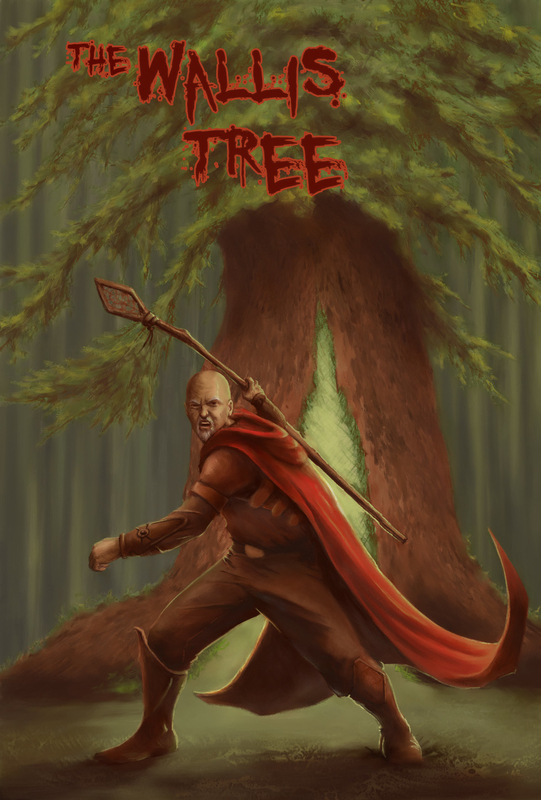 As Agolloch stepped clear the giant tree shuddered. Wilhelm hefted the staff. It was light. He rubbed a rough hand down its smooth side. Agolloch had used a part of this very tree to create Wilhelm all those years ago. He felt like he was holding a part of himself, the greater part. “Supposedly,” Wilhelm said still eyeing the staff.